Do humpback whales laugh? That question had not occurred to me until a few days ago. 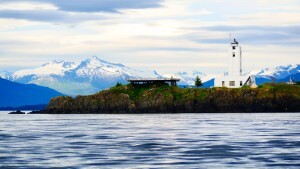 I was sitting at my computer in the old radio room at Five Finger Lighthouse, listening to sounds of a nearby humpback whale being broadcast live over a speaker and it made a sound that I could only describe as a slow, deep throated chuckle. Was the whale laughing? Just thinking about it makes me smile. While not one to steadfastly resist anthropomorphizing to the point of speculative restraint that your typical scientist is wont to do, I nevertheless look for evidence and reasoning to support a hypothesis when it comes to assigning “human” logic or motivation to animal behavior. 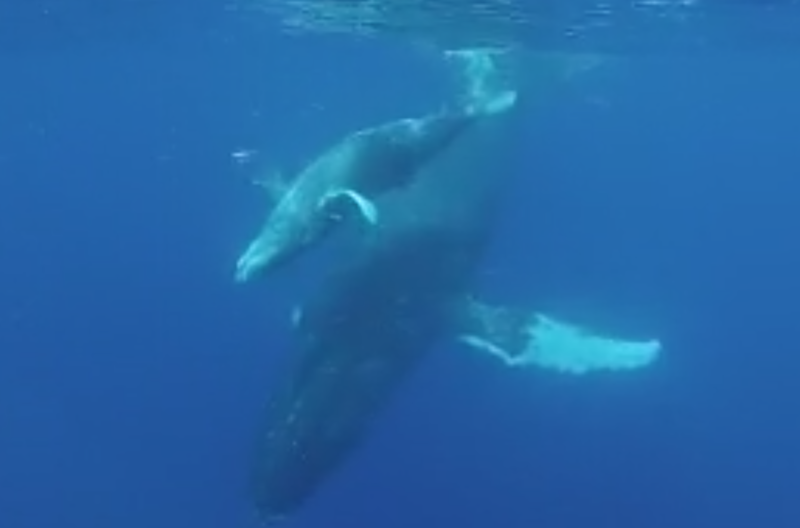 The fact that I am able to listen to whale sounds live over a speaker gives me a unique opportunity to explore the question of whales and laughter. 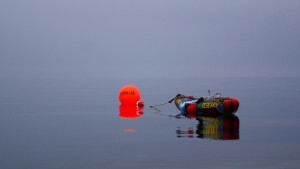 We have a hydrophone, an underwater microphone, deployed about 200 yards offshore. It hangs thirty feet down into the water off of the back of a moored kayak and it records day and night, as long as the batteries last. 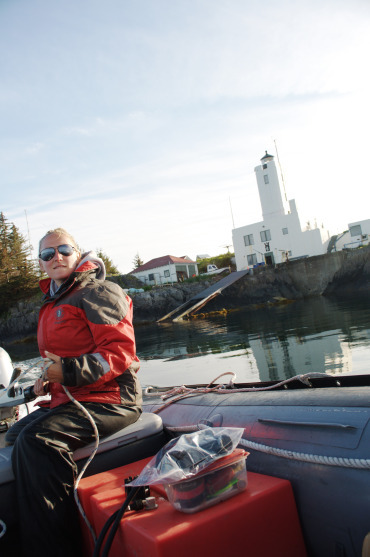 It’s been quite the project to get the system working with the longer recording sessions we had hoped for but it’s really rather amazing that we can even do this at all- listen to whales “talk” from inside the lighthouse- so I am happy for any success that we have. Placement of a full time hydrophone has been a goal here this summer to fulfill a couple of purposes. 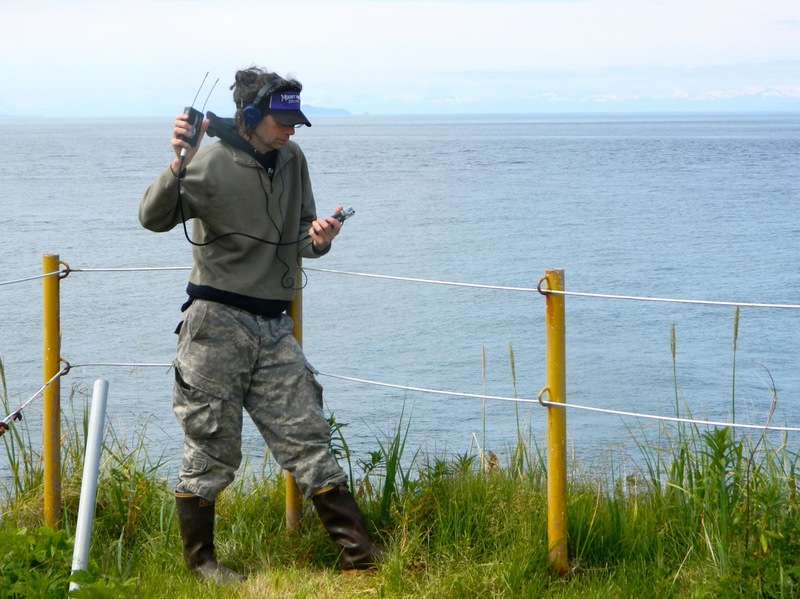 One is for researchers to use it in studying humpback whale vocalizations. 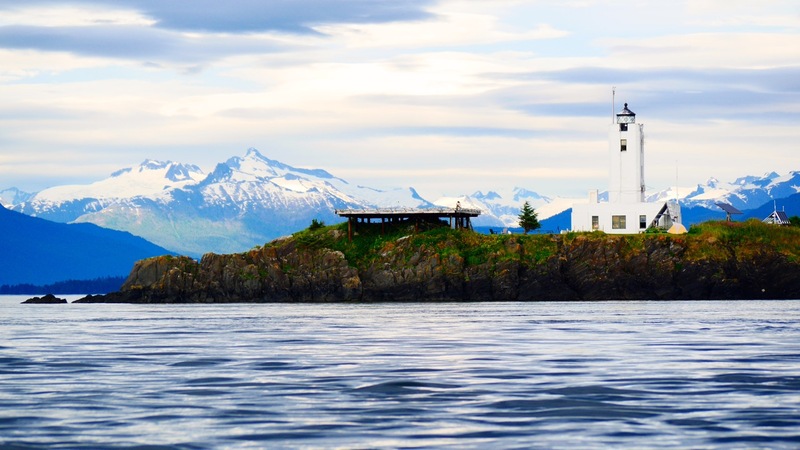 Another is the opportunity for visitors to the lighthouse to hear live underwater sounds of marine life, hopefully whales, if they are around at the same time the whales are. Eventually we would like to stream the hydrophone sounds over the internet but that may not be fully realized until next summer when our connection speed will reportedly be improving and we are able to purchase a dedicated computer. 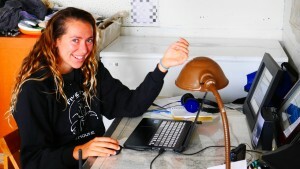 I share the radio room here at the lighthouse with Dawn Barlow, a young researcher who is here conducting a study of humpback whale vocalizations for her senior project at Pitzer college. She is looking at how vocal behavior varies with certain environmental conditions, such as tidal activity and light levels. She is also looking for any relationship between call type and abundance. 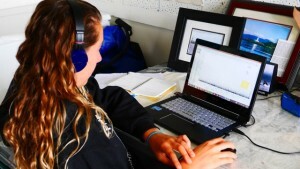 Dawn spends endless hours on her computer, analyzing the vocalizations that she is recording that are coming from the hydrophone. I turn around in my chair and ask the question, do whales laugh? When Dawn hears the question she spins around in her chair, takes off her headphones and smiles at me. “You said you heard one laughing yesterday,” she says. “I know, but do you think they laugh,” I ask. She stands up and stretches, with a young athlete’s elegance and limberness, and says, “I think they are certainly capable of that kind of emotion, so there is no reason to think that they couldn’t.” I wonder to myself, is not thinking that they can’t the same as thinking they do? I think Wavy Gravy is right, laughter helps keep us sane. But I also think that laughter is more than just a release of tension. It also can be an expression of pure joy. Play and laughter often go together and it’s obvious that animals play, especially young ones. Play and laughter have, in the past, confounded scientists because those behaviors do not appear to have any obvious utilitarian function. Laughter has been described as the accidental byproduct of natural forces. Isn’t that what some say the whole universe is? I asked the lead scientist here, Dr. Fred Sharpe, if whales laugh. At first he says, no; they may have a behavioral acoustical equivalent but that laughing in the sense of how hominids do it, that diaphragm staccato release is a behavior rather specific to apes. Then he says we don’t have any evidence that they do other than their mischievous behavior towards us. 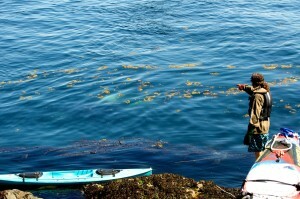 Dr. Sharpe points to large underwater orca. A couple minutes later he comes out to find me and says there is a commonality among animals in many types of sounds, angry grunting, plaintive cries, warning calls. He speaks of motivational structural rules. He then says perhaps our system will be a test of that. 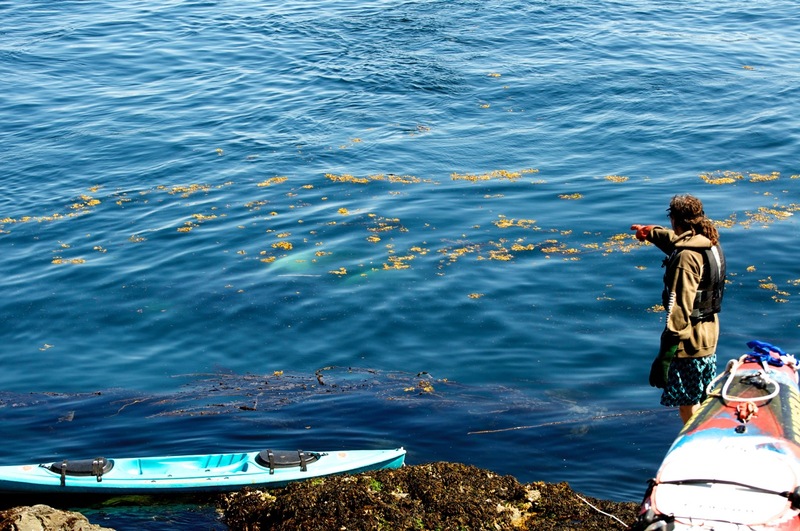 And that some of the humpback’s sounds make us laugh and one can’t help but wonder if there’s a mutual response. Before he walks away he adds that humpback whales are surely complex enough that laughter could have evolved and have a function. I read recently about someone who studied rats said who stated that he was able to make them laugh by tickling them. Tickling rats, there’s a fine research project. If rats can laugh, why not whales? I wonder how one would go about tickling a whale. 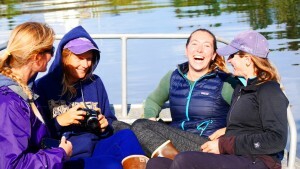 In pondering if a whale laughs, is it important to ask why a whale would laugh? Do the Alaskan humpback whales need a release from tension? Would they be more likely to laugh in Hawaii, where the business of feeding is done for a few months and everyone is looking to get laid? There could be both joy in success for the lucky ones and tension that needs to be released for those looking for a piece of the action. 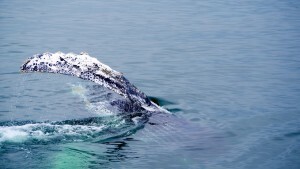 And here in Alaska, where whales feed more or less continually for six months, do whales feel tension when prey is spread thin and feeding is difficult? Is there bliss in finding the perfect prey patch? Do the cooperating humpbacks feel joy that bubbles over when successfully working together to capture speedy and elusive prey, such as herring? 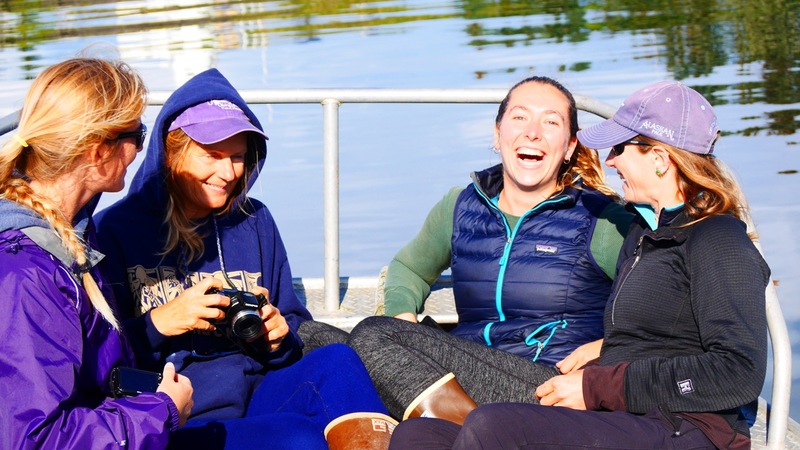 One of Dawn’s advisors is Michelle Fournet, who spent the entire summer here two years ago extensively recording whale vocalizations and classifying them into sixteen different call types in four vocal classes- low-frequency harmonic, pulsed, noisy/complex, and tonal. 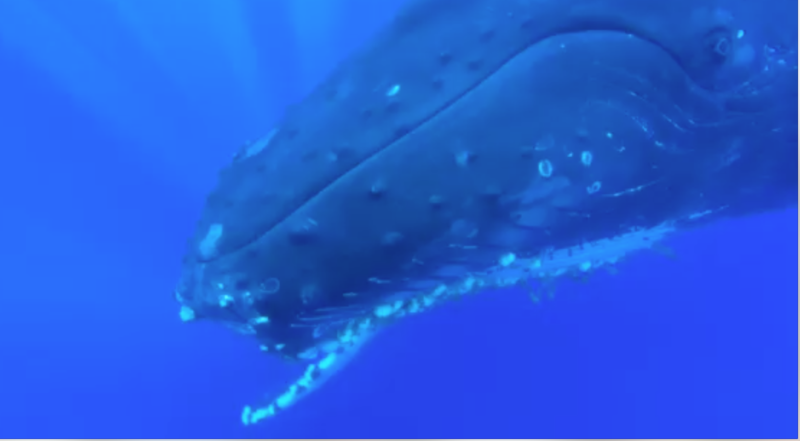 When separated in the food-rich, murky depths, do humpback whales make funny sounds simply to entertain each other and themselves? Wouldn’t that be funny? Their sounds make us laugh at times. At other sounds we simply sit in amazement as we wonder at their meaning. 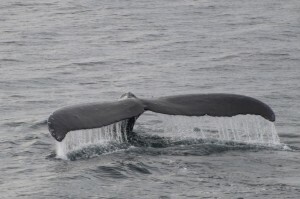 That humpback whales are intelligent, highly social creatures is evident, given both the physical makeup of their brains and their behavior, especially here on the feeding grounds where a variety of prey species and environmental conditions demand a wide repertoire of feeding strategies, including, at times, cooperation of a sophisticated nature. A full CD of audio recordings of humpback whales and other animals here at the lighthouse will be coming out this fall, in the meantime, savor this nugget as you think about whether whales can laugh. This is two separate recordings put into one 50 second clip. Wow…I love the audio ! Who knew ???????????? ?